Duplicity works with the MailChimp for WordPress plugin. First install and activate the plugin. Then go to the MailChimp for WP settings panel in your admin menu. You will need to obtain a MailChimp API key. Follow the link provided by the plugin to obtain that, enter it, and save. Then you'll need to set up your form. 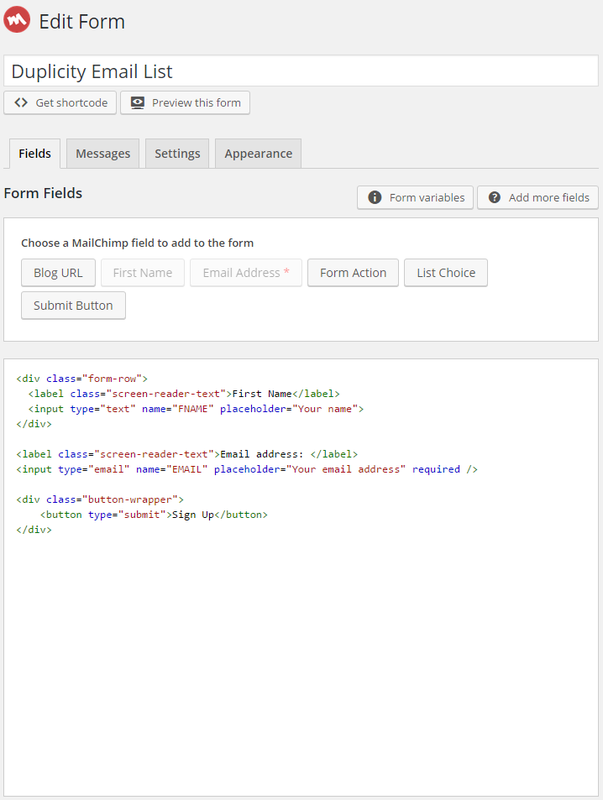 Go to MailChimp for WP > Forms, choose a name for your form, and select a list. Putting the <div class="button-wrapper"> tags around the submit button. Without those two changes, the submit button will not get the cool overlapping effect! Make sure "Form Style" is set to Inherit from Duplicity theme. 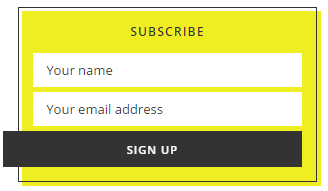 Adding an opt-in form to your sidebar. Once you've set up your form, you can then go to Appearance > Widgets and add the MailChimp Sign-Up Form to your sidebar.